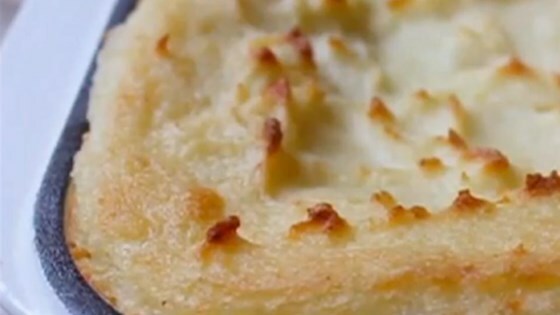 "Not only is this a delicious alternative to regular mashed potato recipes, but it's a very user-friendly way to serve your potato side dish. They're really decadent: not too rich, but just rich enough, and perfect for any special occasion." Place potato halves into a large pot of salted water, bring to a boil, and reduce heat to medium-low. Cook until very tender, about 15 minutes. A knife should pierce the middle of a potato half easily. Transfer potatoes to a colander and drain thoroughly, about 5 minutes. Whisk mascarpone cheese in a mixing bowl until smooth. Stir egg yolk and milk into mascarpone cheese, whisking until smooth; season with salt, black pepper, and cayenne pepper. Transfer potatoes to a separate large mixing bowl, add butter chunks to potatoes, and season with salt and black pepper. Mash butter into potatoes with a potato masher until fluffy; a few lumps are okay. Whisk mascarpone mixture into mashed potatoes. Spread mashed potatoes into a 9x13-inch baking dish. Smooth the top and use the tip of a spatula to lightly press the potatoes and lift up to create little peaks and valleys in the top. Bake in the preheated oven until potatoes are heated through and top is golden brown, about 20 minutes. You can make this ahead anytime during the day you plan to serve the potatoes. Just bake a little longer. For more color on top, you can broil the potatoes if desired. Great idea to add mascarpone but doing so makes it more rich i would definitely cut the butter by half at least. The mascarpone is a genius addition. I used more though than the recipe called for. My potatoes came out decadent, creamy and delicious. Easy. Mine seemed a bit salty, but I suspect I did something wrong along the way. Still, it was the dish that did not stretch to the day after Thanksgiving, my guests ate it up!